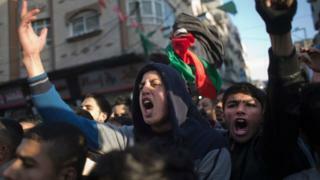 Security forces in Gaza have broken up a protest by thousands of people who demanded an end to electricity cuts. Stones were thrown as security officers of the Hamas Islamist movement, which controls Gaza, fired in the air and dispersed the crowd. Locals now get just four hours of power per day, instead of eight-hour cycles. A vital plant was badly hit in fighting with Israel in 2014, but financial troubles and inter-Palestinian tensions have also contributed to the crisis. A Hamas spokesman said security forces had tried to prevent protesters from storming the headquarters of the electricity company. Gaza's two million residents have faced cold winter conditions. Some have improvised by burning scrap wood and using old kerosene heaters. Protests in Gaza are rare but have grown as a result of the electricity crisis. Meanwhile, comedian Adel al-Mashwakhi was arrested hours after posting a video criticising Hamas, the Associated Press news agency reports. "There is no work, no crossings, no food, no water to drink and also there is no electricity," he said in the one-minute video, which has been watched more than 250,000 times.